For my second entry into the Bloggers Quilt Festival, I thought I'd like to enter my Ella Bubbles quilt. I love this quilt and am excited to be sending it (her) to Kiama for exhibition in Australia's only Modern Quilting Show. 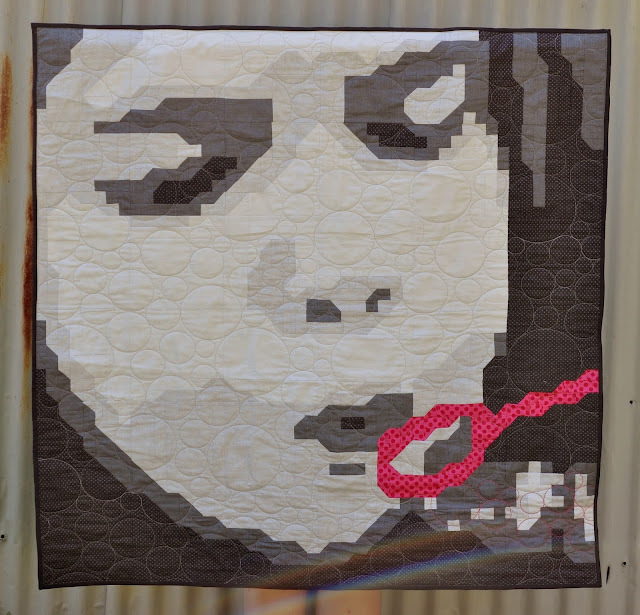 This is the first YouPatch pixel quilt that I have made incorporating half-square triangles (HSTs). They allow me to create smoother, rounder lines which is perfect in a quilt about BUBBLES!!! This image shows the progress from image, to pattern, to quilt. It also shows that I've adapted the suggested color scheme in the pattern and have chosen my own palette. The quilt measures 48 inches square and I am entering it into the "Small quilts" category. I hope you like it. You should check out the other quilts in the festival. Or maybe enter one of your own. this is so charming and the bubble quilting is just perfect! I hadn't come across your software before. It opens up so many possibilities! I love how you changed the colours on this one. It still has the touch of an artist.